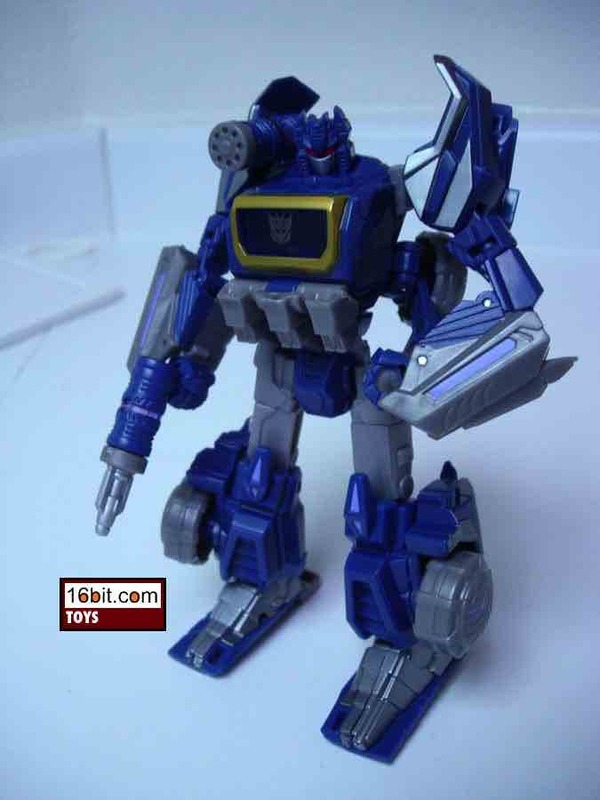 The fourth War for Cybertron figure is this swell Cybertronian Soundwave figure, which transforms from a robot to a box. You'll recall the original Soundwave, on the cartoon, turned into a lamp post on Cybertron. Depending on who you ask, this design is a lateral move. A boxy vehicle does place it in line with recent toy releases in Transformers Animated and this year's Speed Stars vehicle line. 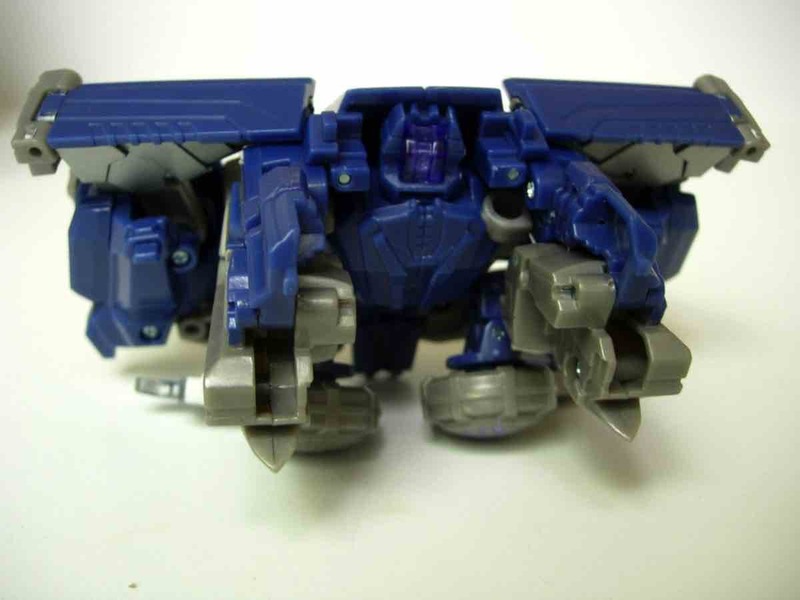 Rather than turn into a proper vehicle, he has this toothy grill in the front (the central three prongs are articulated together) and there's an opening "windshield," too, and you can store his weapons either in there or on the sides of the car. 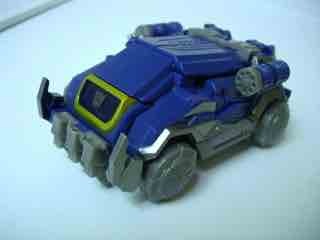 Soundwave is pretty swell as play features go, but you'll notice some gaps in his vehicle mode. It's cool, but by no means perfect. Standing at about 6-inches tall, the figure is of a pretty good (and normal) size. His shortcomings start becoming apparent as you really look at him close, because the former blocky tape deck robot is pretty spindly in places. 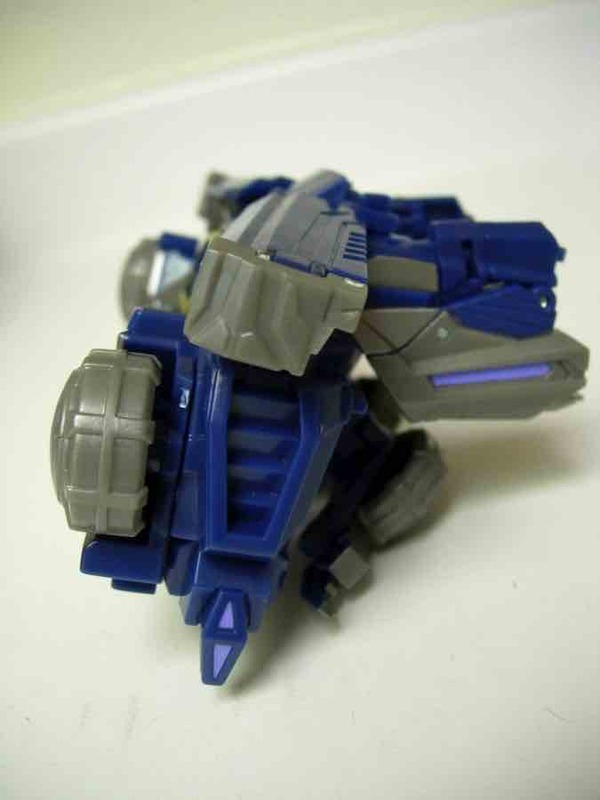 His elbow joints are a little awkward, although there are lots of points of articulation mixed in there. His spiky shoulders look cool, and decidedly un-Soundwave-y considering that his color scheme, head, and torso barely even try to redesign the original form of the character. Er, toy. Whatever. But yeah, the body. The elbows are quite thin, especially compared to the legs and forearms. Soundwave has excellent ankle articulation, and if you're willing to mess around with him I'm sure you'll get some amazing poses out of this toy. If you want him kneeling and shooting, he can do it. Since his wrists rotate (but stiffly) you can probably make up for the very thin arms when posing him, but his head is pretty small and sometimes he does look like a bit of a pinhead. It's still a nice toy, but really, would a slightly larger head have hurt? Of course, the original Soundwave was a mini-cassette player, and this is a car. 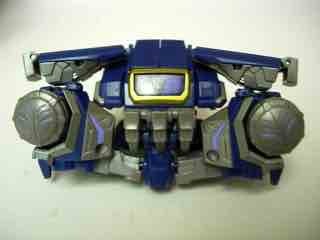 A fan mode, which I am told sorta appears in the game, was created and it seems no two fans make it the exact same way-- but you can manipulate the figure to look something like a boombox. Clever. I have no idea if this was intentional or not. To see the "boombox" from the back, see below for more image. He has no problem carrying his accessories in any mode, and thanks to his pivoting and swiveling wrists you can force some nice poses out of this guy. I've even seen fan modes of some sort of weird futuristic sound system, using the wheels as speakers. For those who like to futz with their toys, you can probably have a good time with it. To date this arguably is the overall weakest toy in the "WFC" series, but the character's popularity will drive sales. It's fun to transform but the design could've used a little more work just to solidify it a bit. I'd be lying if I said it wasn't fun to mess with, though, so you can probably ignore any and all naysaying and get this one. It isn't the most amazing toy, but it certainly meets our high requirements, which are that a figure be "good enough." He is. Remember, no toy will ever be Soundwave from 1984... except Soundwave from 1984. 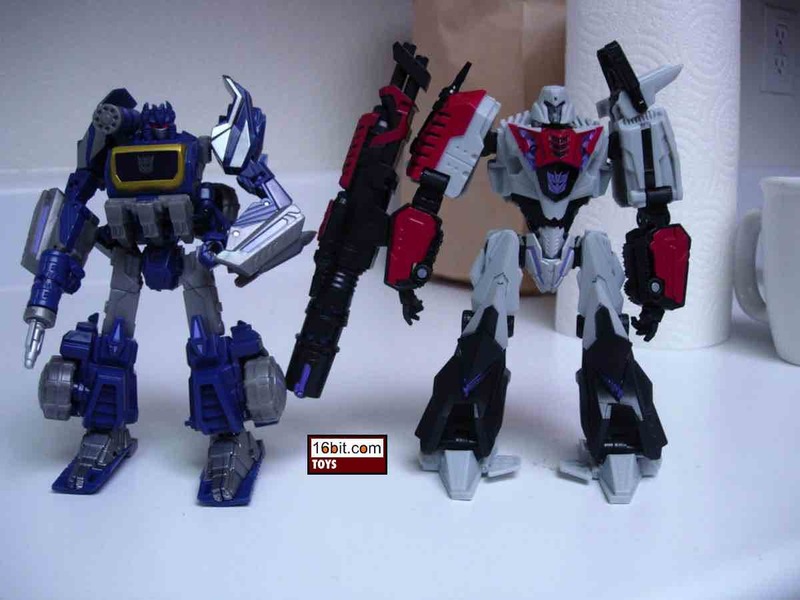 Even Hasbro couldn't remake it in their Titanium Series line, so fair warning that Cybertronian Soundwave is a good enough toy but won't replace the original.